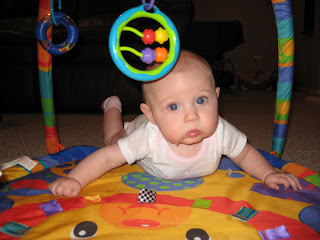 Sunnin' In the City: Kiya Can Crawl!? I couldn't believe it myself. I mean, I have noticed her scooting herself around, but I didn't quite believe it. I mean, this is a bit early, don't you think? I know that girls tend to progress faster than boys, but I just thought that applied to language. Maybe this is developmentally normal, I don't know. My little monkey is just NOT satisfied to be left where we put her. No siree, she wants to move where her little heart and pudgy little legs will take her. Of course she cannot go very far, but she is working on it. Her childcare provider said that she crawled 4-5 scoots today (I was at work and didn't get to see it) :( **Sigh...double sigh** I'm still in awe that she can hold her head up high. She still has a tendency to do the bobble head thing, but she is pretty strong. Caiden HATED tummy time with a passion. Kiya can't get enough of it! Now I see why. Go Kiya...soon she will be leaving everyone in the dust! She is a superstar and it must be because she and I are good friend!! LOL!!! Heather you kill me. She is a fighter. She definately won't be left behind much longer. An older sibling is quite an incentive to get going soon. You have got your hands full there Melissa. Next time I see her she may be crawling circles around me. How fun.